Huawei's Ascend D2 and Ascend Mate created a lot of buzz among the tech enthusiasts at CES, but the company is not done with the announcements. A press image of the Ascend P2 has just leaked ahead of its MWC announcement, which is set to take place on February 24. 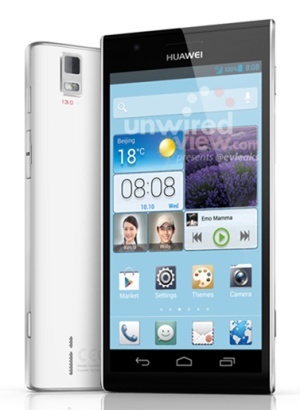 Huawei Ascend P2 is rumored to sport a 5" IPS display and is expected to pack a powerful 1.8 GHz quad-core processor along with 2 GB of RAM. The device also comes with 8GB of internal memory, 13 megapixel rear camera and 1.3 megapixel front camera. Ascend P2 will be powered by 3000mAh battery and will run on Android 4.1 Jelly Bean. The design of Huawei Ascend P2 looks quite impressive in that leaked press image, too, so this might be one to keep an eye on. Everyone using 3000mAh battery it seems yet Sony the big name went with 2330mAh what a big shame.